Are you looking for an affordable portable AC that can cool a mid-size or larger room? 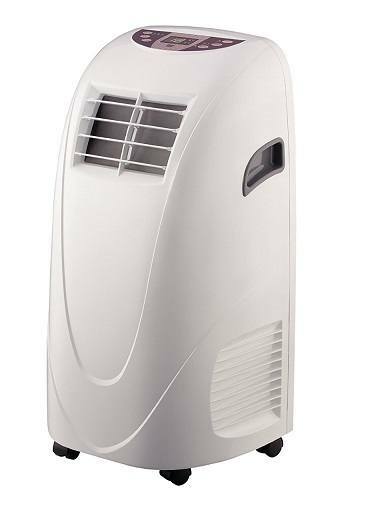 The Global Air 10,000 BTU Portable Air Conditioner might be your best choice - it is a compact portable AC with 2 modes and a self-evaporative drain system. It’s also really easy to use and comes with a remote control so you can change the settings without getting up. You can also use the control panel on the unit. This AC is rated at 10,000 BTUs, which is powerful enough for medium to large rooms of 300 square feet or less. If you need a more powerful or smaller unit, see our full list of the best single-room air conditioners. Easy installation and setup. Easy to use too. Can be used with a carbon filter. 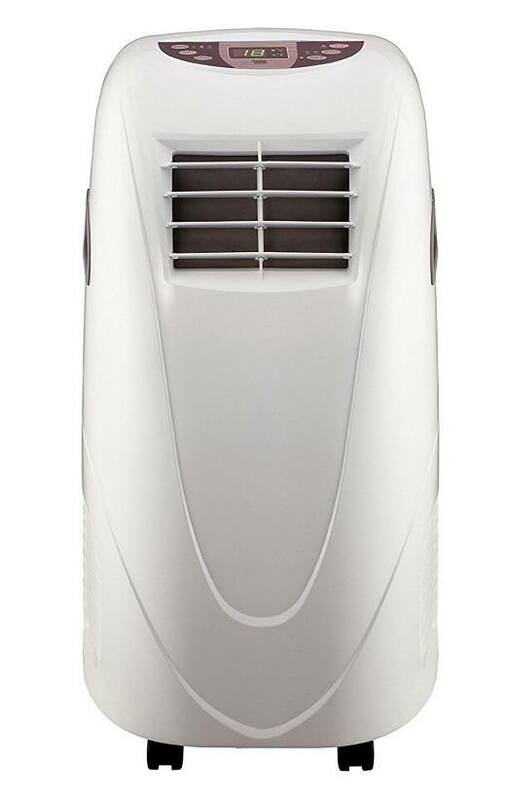 This Global Air AC quickly cools a mid to large sized room thanks to its 10,000 BTU capacity. The maximum recommended room size is 300 square feet. As some customers mention in reviews, it can cool a room a bit larger than that though not as quickly or efficiently. We recommend sticking to the size recommendation. For extra-large spaces over 400 sq. ft. definitely get a more powerful AC. 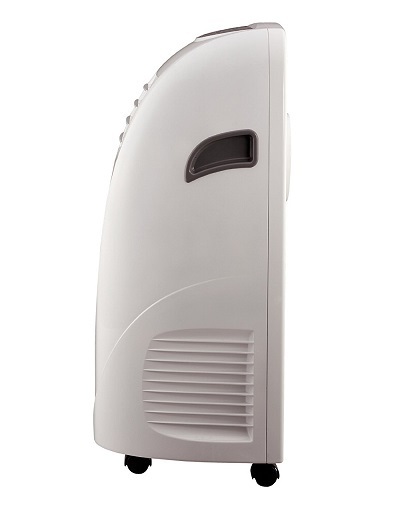 When activated, the fan blows cool air into the room. A 4-way vent design ensures that cool air reaches every corner of the room. The fan-only mode is ideal when the room isn’t too hot. It uses a lot less energy. 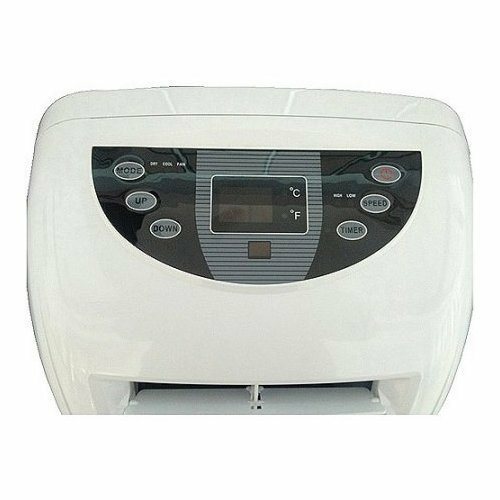 The automatic mode automatically works the cooler and the fan depending on room temperature. The control panel is located at the top of the unit. Here is where you’ll find all the settings you need; the same settings available on the remote control. The mode button allows you select your preferred function mode –auto, cool and fan. The UP and DOWN buttons are mainly for increasing or decreasing the target temperature. They also set the timer and change temperature units from F to C.
The SPEED button alternates between two speed settings – high and low. These settings reduce or increase the amount of airflow from the AC whether you’ve set it in COOL or FAN mode. There is also a timer which is great when you want the unit to switch off after some time, automatically. This AC is self-evaporative meaning that condensation from the air passing through the unit is exhausted outside. While this feature works well, in theory, it’s not perfect in real life. Several customers have complained about water leaking from their drain plug and damaging the floor. So you'll need to keep an eye on that. This only happens when there is too much humidity in the room and the evaporator can’t exhaust it all. If you see the LED panel reading “FL,” that’s an indicator that you should manually drain the water using the drain plug. The digital controls are easy to use and allow you to set precise temperature settings (compared to turning a dial). The large buttons depress easily, and there are LED lights to show you what settings are active. But you don’t have to stand to use the control panel every time you want to change a setting. The max cool mode switches the unit to the highest cooling power. The fan runs at its highest speed to speed up room cooling. Fan speed settings don’t work in this mode. The sleep mode is for sleeping. The fan runs at the lowest speed, and the temperature only goes up 1 degree every 2 hours but stops after a 2-degree increase. This warms up the air slightly as the night gets colder but remains comfortably cool. You can install a carbon filter on this AC, too. Carbon filters are great for cleaning the air and eliminating household odors. There are two common problems reported on this model. This unit isn't the best choice for high-humidity environments. If you don’t regularly drain it manually or connect a drain hose, it may leak water onto your floor. If you decide to buy it, keep a close eye on it especially at the bottom near the drain plug. If you notice any leaking, start draining it often or connect a drain hose. The second issue is the relatively high level of noise when running full-put. If you use it in your bedroom at night, you will want to reduce fan speed to keep the noise down. Noise level: Not specified but can be loud, according to customers. This portable AC exhausts outside, which is really convenient. It’s easy to install, easy to use and easy on your pocket. Just don't buy it if you need to cool in really humid conditions. I’ve worked as an HVAC tech in Phoenix, AZ for the past 10 years. I created CoolAndPortable.com to help home owners select the right portable air conditioner, cooler or air purifier for their needs & budget in just a few minutes. Subscribe now to receive more articles and offers, like this!